VCXO with PLL to be locked to any kind of frequeny reference. The first version was built approx 1995. Now several modification have been done. 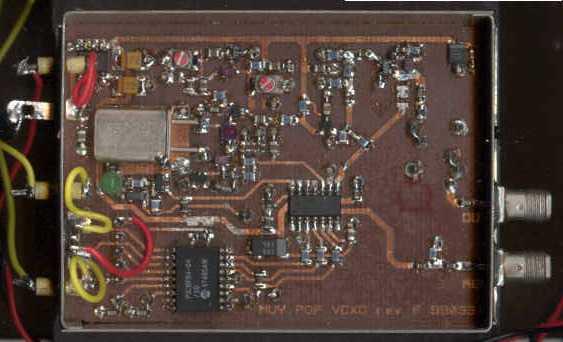 The latest was to remove the eeprom and some HC-logic and to replace it with a PIC 16C84/16F84 that can be programmed on board. The heart of the design is an emitter coupled harmonic oscillator( BFS520) which have good short term stability. (RF design, Oscillator design handbook) It is easy to add a varactor in this circuit to pull the oscillator an small amount in frequency. The oscillator is followed by a transistor buffer (BFS520). The signal is fed into an attenuator and a small Si MMIC (MSA2111) to further increase isolation towards the oscillator. In some cases I have used the MMIC as a multipler. Then the attenuator is adjusted to make the MMIC go into compression it is followed by a helixfilter(TOKO) to select the wanted harmonic. The resistor in the bias circuit can be optimized to improve conversion loss in the multiplier. The synthesizer is a Siemens/Infineon PMB2306T wich is loaded with serial data, Data-Enable-Clock. The signals for loading the synt is generated by the PIC processor 16C84/16F84. The PIC can be programmed on board just by removing two 0ohm jumpers. I use MPLAB from Microchip and a programmer attached to the PC parallell port. I will add some examples of code for the PIC processor on this page later. Programming software: look for PICPROG by Conquest systems (ZL1HIT) a very nice pice of software and a good description of the needed hardwar, or IC-PROG (added 2004-10-26).. The PLL loop filter has to be designed for the selected reference frequency. There is no component values in the component placing drawing. 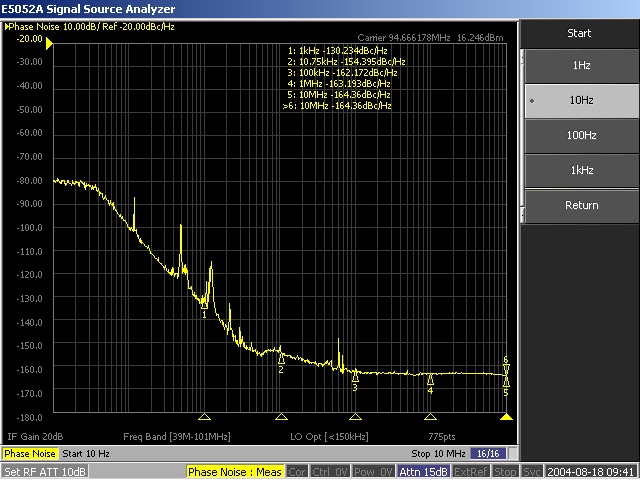 A phase noise measurment has been performed with the new AGILENT E5052 Signal Source Analyzer. I got this opportunity at an Agilent instrument demonstration. Thanks to the Agilent guys ! Things, good to know if you are trying to build this VCXO. The xtall has to be approx 3 - 4 kHz higher in frequency than the wanted fq. So if you plan building it for 106.5 MHz then you have to order an xtall for 106.503 MHz, this is because the wanted pulling range is +/- 3 kHz. I do usually order 5:th overtone series resonant xtalls. Run the oscillator and connect a trimpot to gnd and +5 V) and the wiper to the cap-diode so you can check that the osc is running ok and that you get the wanted pulling range. Tune the trimcaps in the osc so that you get approx 2.5 V when you are at the centerfq and so that the oscillator starts at power on. The inductor and the type of capdiode affect the pulling range, you may have to change these. The inductor usually ends up in the range 100-390 nH. In some cases it has been necessary to remove the 2.2 pF cap mounted from base of the osc transistor to ground. Change from rev F to rev G, I found that there was a capacitor (1 nF) lost at the bias of MSA2111 between the inductor and the resistor. Should be connected from the connecting point of the 39 ohm/220nH and to gnd. Unfortunately I have found out that the PMB2306 is becomming obsolete ! Use GSview to view postscript documents or download and print on a postscript printer. as I am no programmer and just do it because I have to. Anyone who likes to create better code may do so and I am interested in a copy.